Border stickers are a quick and easy way to dress up a page but if you use them too often, sometimes your pages can start to look a little too similar. If you can see this happening in your albums, try dressing up your border stickers a little. Adding small details can really enhance your page and make it unique. 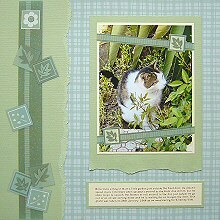 This layout was created using Colorbok Sage Plaid paper for the background, Green Bazzil cardstock, Cream cardstock and Pebbles Inc Traditions Borders stickers. This simple, but effective layout can be completed in 30 minutes. The key to the success of this page is the effective matching up of the greens. The papers not only complement each other, but draw out the green leaves in the photo. When recreating this page, begin by making your side border. Tear a strip of green Bazzil cardstock about 9-9.5cm wide and use as the basis of your border. Be careful when tearing. Bazzil is a heavyweight cardstock and can be difficult to tear. Hold the paper firmly and slowly tear towards you. When you have your strip, adhere down the left side of your background paper. Adhere your border sticker down the middle of your Bazzil strip. Use your tile stickers to embellish your border by scattering them over your border sticker like confetti. Play around with them to find the arrangement you like. Next, move on to your photo. Begin by matting it on cream cardstock. You are now going to use another of your border stickers to embellish your photo. It is the one featuring three leaves. Cut your border on either side of the middle leaf. Discard the middle leaf (or put away for another project). You now have two strips that are mirror images of each other. These strips are going to be placed across the front of your photo. However, you don't want them to hide too much of your photo and distract from the photo itself. To avoid this, remove the excess green background by cutting out the image of the ribbon and leaf square. I suggest that you do not trim the length of each strip until after it has been stuck down. Angle your strips across the front of your photo and when you are happy with your placement, stick them down. Make sure they reach right to the edge of your cream cardstock. When they have been attached, trim the edges so they are inline with the edge of your cardstock matt. Now matt your photo on your Bazzil. Make the border approximately 1cm wide on all edges except the bottom. Leave some extra room along the bottom so you can tear the edge. This time you want to create a different edge to the one on your border. To do this, turn your paper upside down and tear in the same manor as before (tearing slowly towards you). When you are done, turn it back the right way and adhere to your background. Finally, write or print your journaling on a strip of cream cardstock, matt it with your Bazzil and adhere under your photo.